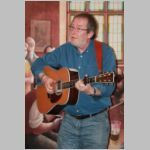 Colin Pitts first began performing in folk clubs while a student in Swansea in the late sixties. He re-emerged as a serious performer in the 1990’s with a reputation for writing songs that sometimes make you think, sometimes make you laugh and sometimes just make you feel good. Several, including “Jeannie’s Flag”, “Australian Wine” and “Let Her Lie” have been recorded by other singers and it is not unusual to hear them sung in a folk club, festival or on radio. Colin is back after an illness with a new crop of songs and his singing is stronger the ever.